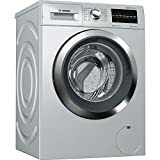 These days the living standard of people is rising very rapidly and due to which they do not even have time to clean clothes by their own so the trend of washing machine is at its peak. The Bosch WAS24460IN 8 KG Fully Automatic Front Load Washing Machine comes to rescue their times and extra efforts. Bosch WAS24460IN 8 KG Fully Automatic Front Load Washing Machine operates at a speed 50 Hz and comes at your door with a warranty of 1+4 year. The Price of Bosch WAS24460IN in India Starts from 22,500 Rs.